For the last Unblurred of the year, Studio 5013 features Gruss vom Krampus: a Krampusnacht mixed-media diorama starring the Bad One himself. Created by the curators of Studio 5013. Through December 31. For those unfamiliar with the Krampus legend: He’s Santa’s evil sidekick, a Satyr-like creature appearing in Alpine lore as a way to scare bad children into goodness. There are Krampusnacht celebrations on December 6-eve with people dressed in the most amazing/terrifying costumes made of goat fur and giant horns (this Atlantic article has some great photos). 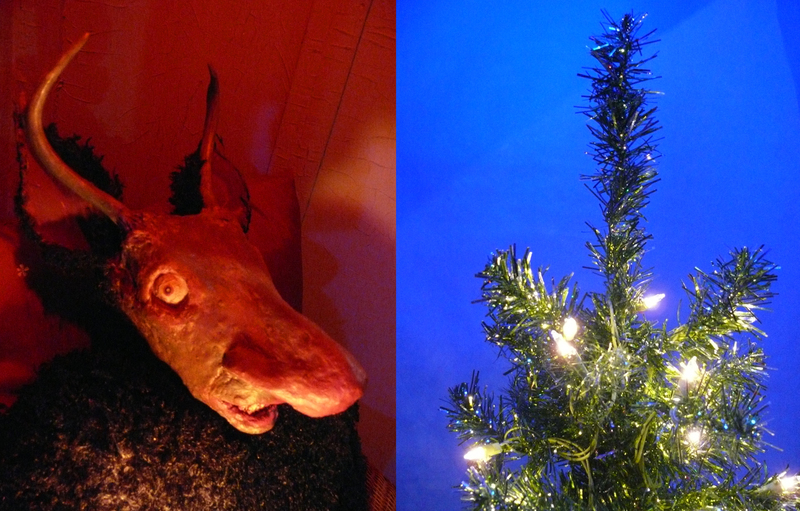 Jeff constructed our Krampus from studio scraps: chenille craft fur, wooden dowel rods, Plasti-Dip, dental molds, paint trays (flipped over for the eyes), a crooked old tree branch for a staff, and a deer skull. Happy Holidays! Wow, that is one scary Krampus! Nice to see a counterbalamce to the St. Nick image which I always found a tad weird too). Am down in Costa Rica at the moment and there are huge billboards of Santa drinking–what else?–Coca Cola. Haha! Lucky you, soaking it up in Costa Rica during these cold months. I can tell it’s going to be a long winter (have fun!). Celebrate the Krampus! So Awesome!